Want to have little fun while using Google Search. 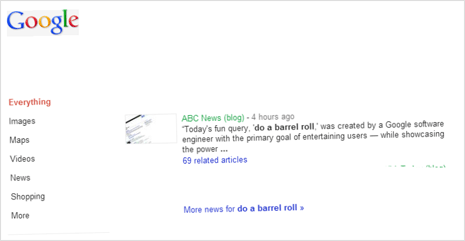 ‘do a barrel roll’ query in Google Search produces animated effect similar to barrel roll. This latest easter egg for Google Search is getting very popular for its simplicity and pleasing animated result. Try this effect just now by opening Google Search on your PC. 1. Open Google.com in web browser on your computer. Make sure you use either of Google Chrome, Safari or Firefox browser to make this trick work. 2. Type do a barrel roll in the search box and press the Enter key or just click here. You should notice cool animation with Google Search page rolling two times similar to barrel roll effect and then setting to default static form. Above video show barrel roll effect on Google Search page when ‘do a barrel roll’ query is used. For sure cool trick for some fun with Google, what say?